OR, of course, you can just go to Google. I got 63 candies! How does Google do it? They have announced new algorithms for searching. We live in an amazing age and exciting times. 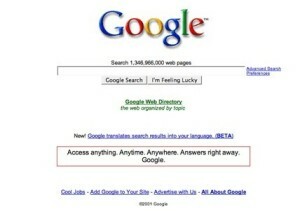 The first time Google created a doodle to celebrate its birthday was way back in 2002, to mark Google’s 4th birthday. Enter the term ‘google in 1998’ and you’ll see how Google used to look in 1998. The Google logo wasn’t centered until 2001. Google rents goats from California Grazing to graze their HQ land. They say it’s cuter than lawnmowers. If you question these facts, just google it! !